Young shrubs should be pruned lightly to make them grow fuller and bushier. 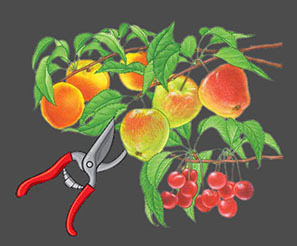 With hand pruners, trim long, unbranched stems by cutting just above a healthy bud. This type of pruning, called heading, encourages lower side branches to develop and enhances the shrub’s natural form. When selecting a bud tip to trim to, keep in mind that the new branch will grow out in the direction of the bud. Like most pruning, heading cuts should be timed to avoid disrupting the plant’s flowering. As a shrub develops, thin out old, weak, rubbing, or wayward branches where they merge with another branch. This opens up the middle of the plant to more sunlight, which keeps interior branches healthy, stimulates growth, and increases flowering. Neglected shrubs may call for a more drastic approach: hard pruning. Most deciduous shrubs that respond well to renewal pruning can also take hard pruning, as will a handful of broadleaf evergreens, such as privet. Using loppers and a pruning saw, cut back all stems to within an inch of the ground during the plant’s winter dormancy. Come spring, the plants will quickly produce new shoots from the base. Of course, this technique will leave you with little to look at while waiting for the new growth. 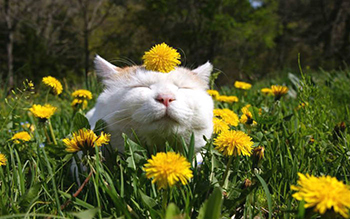 If stray cats in the neighborhood are wreaking havoc on your garden, take a few old rags, immerse them in white vinegar and place them on stakes surrounding your vegetables, for example. Keep the rags “fresh” by re-soaking them in intervals of between 7 and 10 days. You can keep cats away by spraying vinegar using a trigger-spray bottle on garden accessories, on tree bases, on plants, on your garden border, on posts and on your fence. Focus on parts of your garden the cats seem to visit the most. Repeat spraying several times a week or whenever the need arises. You also should spray after watering sessions and rain. If you don’t have white vinegar in your home, red wine vinegar can work as well. White vinegar on its own can sometimes harm plants or items on your property. If you’re worried about that, dilute it with one to two parts H20. Although vinegar doesn’t harm all plants, it makes some of them turn brown. Always test surfaces, such as garden accents or painted surfaces, before applying vinegar to ensure the vinegar won’t damage it. Easy Care & Plentiful Berries! When it comes to selecting blueberries for the home garden, rabbiteye types are the best choice. One of the advantages of home garden blueberry plants is they seldom require spraying for insects or diseases in most areas of the state. 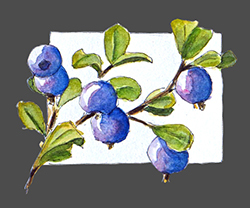 Under good management, blueberry bushes will produce some fruit the second or third year after transplanting. By the sixth year they can yield as much as 2 gallons per plant. The yield will continue to increase for several years as the plants get larger if given good care. Plants can last 10 to 15 years or longer if managed well. One of the most important things to remember about starting rabbiteye blueberries is to plant more than one variety for cross-pollination to promote adequate fruit set. Also, choosing varieties from the different ripening categories provides a broad harvest season. Rabbiteye varieties have been bred for years, and many of the varieties listed are somewhat antiquated. Newer varieties are listed in bold, and are highly recommended to provide homeowners some of the latest improvements offered in blueberry varieties. 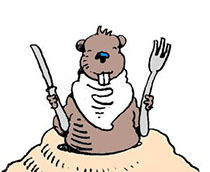 Use a gopher basket to plant vegetables and numerous other plants. These baskets are made up of hardware cloth mesh that assists in protecting the young roots until they are established completely. You can either purchase these baskets from farm supply centers or nurseries or they can also be made at home. Use a double layer of 1-inch mesh hardware cloth. This is used for shrubs and trees that require safeguarding while young or for long term protection. Leave enough space to allow root development. Larger areas can be protected by placing mesh under raised veggie beds. Trees and shrubs: Arbutus unedo, buddleja, callistimon, ceanothus, cistus, escallonia, fuchsia, grevillia, toyon, hydrangea, lantana, michelia, nandina, oleander, pomegranate, ribes, rosemary, salvia (native and nonnative), westringia. Perennial flowers: dietes, lavender, nepeta, shasta daisy, California fescue, euphorbias, foxglove, juncus, mimulus.